Saboten L and ETR-STEREO were posted to German audio magazine "LP"(4/2018). Takumi was posted to The Audiophile Man in the UK in February 2016. Zero and Kotetu were posted to The Audiophile Man in the UK in February 2017. [June, 2015] We were given best Goldfingerprint by a review of stereo cartridge "Madake" from High Fidelity of Polish audio magazine company. Goldfingerprint is the most valuable prize of High Fidelity which a craftsman is given. The company where High Fidelity gave Goldfingerprint is only six companies so far. We are proud of this splendid prize. Various content to be related to Madake is written to a review in detail. Nine products of Miyajima-lab were placed in "2015 Recommended Components" of Stereophile. 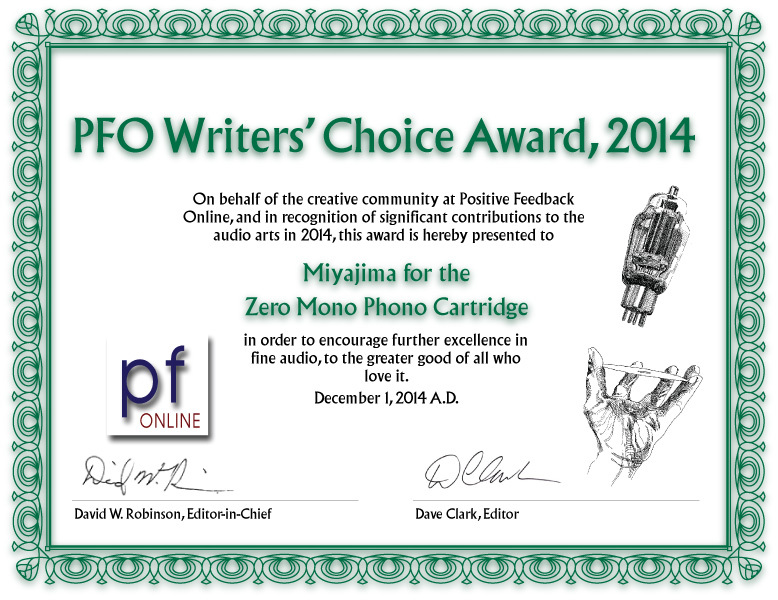 Zero Mono of Miyajima-lab won "PFO Writers' Choice Award, 2014". Please click the left image for the details. In American non profit organization "10audio", Shilabe and Kansui were chosen as "ten most excellent audio systems"! The title of "Perfect10Award" is given to an audio system chosen by 10audio. "Statement Award 2011" in most famous audio magazine company "High Fidelity" in Poland! Stereo cartridge "Madake" was reviewed in France. The following information is American audio show "Capital Audio Fest 2015". Monaural cartridge "Zero 0.7mil" was reviewed with July issue of British magazine "HI-FI WORLD". An American wholesaler participated in "2015 Newport HE Show". The follows are websites of Show. Stepup transformer "ETR-MONO" was reviewed in AnalogPlanet. Stereo cartridge "Madake" was reviewed by 10audio of the non profit organization in U.S.A. These are the lists that Miyajima-lab cartridge was reviewed on a British website. A cartridge of Miyajima-lab was reviewed in Hifi Pig Magazine / monoandstereo. Shilabe was reviewed in "the ear.net". These are the lists that Miyajima-lab cartridge was reviewed in a British magazine. Zero was reviewed by publication in December, 2014 of the HI-FI WORLD magazine. The following link is information of 2014 American Capital Audio Fest of the end of July. Power amp Model 2010 was reviewed in American audio magazine "Stereo phile July issue p.33 - p.37". A cartridge of Miyajima-Lab was reviewed in Polish magazine High Fidelity. ZERO was chosen as 2013 BEST PRODUCT! ZERO was reviewed in U.S.A. audio magazine "Stereophile" by Mr. Michael Fremer! Because it is the best review, please look. It is placed in 21 analog corners of the March issue. The monaural system of the American wholesaler won "BEST SOUNDING HIGH-END AUDIO PRODUCTS 2012" of StereoPhile! Philippine existing President "Benigno Simeon "Noynoy" Cojuangco Aquino III" visited to the room of the Philippine wholesaler in Philippine Hifi show 2012! The follows are information of "2012 New York Audio Show". Cartridge "Kansui" was reviewed in p.32 -p.35 of November issue of STEREO PHILE of the magazine. MONO cartridge "PremiumBE" was reviewed in American magazine Ultra Audio. MONO cartridge "PremiumBE" was reviewed on an American website. Stereo cartridge "Kansui" was reviewed by 10audio of the non profit organization in U.S.A. Stereo cartridge "Kansui" was reviewed on a website in Hong Kong by Mr.Zanden. Cartridge "PremiumBE" was reviewed in p.27 of November issue of STEREO PHILE of the magazine. Cartridge "Shilabe" was reviewed in p.168 of October issue of American audio system magazine "Stereo Phile". Stereo cartridge"Shilabe" was reviewed on an American website. Stereo cartridge "Shilabe" was reviewed in MONO&STEREO of the European evaluation group. The cartridge of Miyajima-Lab was evaluated in "Stereo Phile October issue p.59" of the American audio system magazine. The cartridge which was evaluated is Shilabe and Premium. The cartridge was evaluated by the best ranking. Monaural cartridge "Kotetu" was introduced in a German net magazine. Stereo cartridge "Shilabe" was chosen as the one of three superior cartridges in "Stereo Phile September issue p.39" of the American audio system magazine. In addition, the MONO cartridge "Premium" was introduced in homepage of StereoPhile. Because it is good information, please look by all means. Stereo cartridge "Shilabe" was introduced in a homepage of 10Audio of famous non profit organization. They gave "Shilabe" the best rank. Please look by all means. MONO cartridge "Premium" was included in References of 10Audio, too.